What do an internationally acclaimed sport karate team and a high-end hair care line have in common? You might think it’s next to nothing, but the answer might surprise you! You’re probably familiar with the name Paul Mitchell in one of two ways. Maybe you’ve seen Paul Mitchell brand shampoo at the store or in a salon. Or (more likely for readers of The Centurion) you’ve heard of Team Paul Mitchell Karate, the best-known team in sport karate today. Perhaps you’ve heard of both without consciously connecting them. Or you may have guessed that the shared name is more than coincidence, but you don’t have the full story. Before there was Team Paul Mitchell Karate, there was a small group of karate competitors in the New England area. The team found a brief sponsorship from a martial arts equipment company – unfortunately, that company pulled its support without warning, then went defunct. Fortunately, team co-founder Steve Babcock knew another company that might be interested in a sponsorship. His contact was John Paul DeJoria, CEO of John Paul Mitchell Systems, a giant in the professional hair care industry. DeJoria decided to sponsor the team, giving it its current name. That was over 29 years ago. The relationship between team and brand is the longest-running corporate sponsorship in the sport karate world. Team Paul Mitchell Karate attracts top-notch competitors from around the world, and getting to join is the dream of many young karate athletes. In keeping with Paul Mitchell System’s spirit of philanthropy, Team Paul Mitchell Karate strives to not simply be good at what they do, but to do good in the world as well. Members have performed for schools, for veterans, and at hospitals. The team works closely with the Tori Lynn Andreozzi Foundation, which combats drunk driving. Century also works closely with Team Paul Mitchell, as their official uniform provider. 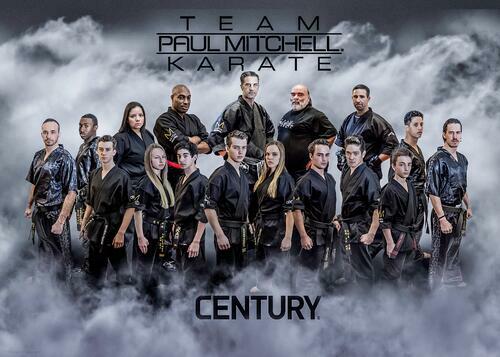 If you’ve been to Century’s Martial Arts SuperShow in the last few years, you’ve probably seen a performance by Team Paul Mitchell. Our relationship with the team also means that occasionally one of them will stop by the company headquarters and lead a class! If you want to learn some tips from Team Paul Mitchell Karate members, you can look up tutorials on Century’s YouTube Channel! Plus, read more about Team Paul Mitchell Karate and its members here.